2017 marked the 50th anniversary of the Central Gardens Neighborhood Association. We celebrated by exploring the history of this great neighborhood, taking looks back at important neighborhood decisions, learning about the neighborhood’s infrastructure and the land beneath us, and highlighting excerpts from Central Gardens - Stories of a Neighborhood. This month, in honor of our upcoming Home and Garden Tour September 10, we will be exploring dual efforts in the 1980s and 90s in preserving our neighborhood and upholding its character to today: in 1981 and the work required to place Central Gardens on the National Register of Historic Places; in 1992 and the efforts needed to gain approval by the Memphis Landmarks Commission and establish the neighborhood as a city- and county-recognized historic conservation district. In everyday conversation the terms are sometimes used interchangeably, and sometimes confused. A thorough understanding of each is important to realizing the weight and significance, as well as the legalities, that define and bind our neighborhood and other Memphis neighborhoods under the very important protections that are legislated by such designations. For our Central Gardens neighborhood, the process started in the late 1970s, roughly ten years after the neighborhood had formed the neighborhood association we know today. By that time the neighborhood had organized to successfully fend off the efforts to bulldoze and pave over the median on Belvedere in 1966-67, and in 1975 to reverse the negative effects that duplexed-zoning was having on the area. The neighborhood had been too late however to stop the development of the two high-density high-rise apartment buildings on Central Avenue just east of Lamar Avenue. As was the case in the 60s and 70s, the efforts to take the next necessary steps to preserve the neighborhood and its unique character came from more developments, in the form of gas stations and fast-food restaurants, that threatened the neighborhood’s “small-town” integrity. The result was the coordinated efforts needed to place Central Gardens on the National Register of Historic Places as a national Historic District. This is, and was, no small task. Nominating just one structure to the National Register requires complete details of the structure’s historical, cultural, as well as architectural significance, and a full inventory of the structure’s key elements and history. Nominating an entire neighborhood, especially one the size of our Central Gardens, requires the actions of dozens of neighborhood volunteers over the course of a few years. The process here was led by resident and architect Jim Williamson. 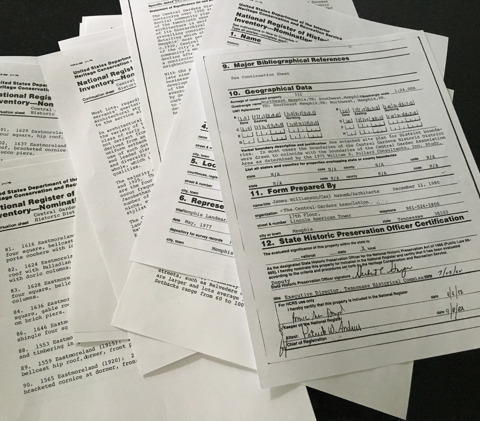 It started unofficially around 1977 with detailed visual surveys by volunteers of the 1,540 structures in the neighborhood; the nomination form was sent to the Nashville offices of the U.S. Department of the Interior in December of 1980; the final approval of the nomination came back in September of 1982.
image: The detailed nomination and inventory form is 188 pages in length. Emphasis here should be placed on the phrase “using federal money”; a designation on the National Register does not protect structures from demolition due to neglect or other private interests. Those extra layers of legal protections must come from local county and city governments under state preservation laws, local charters in accordance with city ordinances, and in the form of local recognitions as preservation or conservation districts. As comforting as national historic landmarking recognition may seem, placement on the National Register of Historic Places has no real legislative protections with regard to demolition due to neglect or various private interests. Developers threatening to demolish historic structures may raise local wrath and outrage, but with the appropriate permits and design plans are more or less free to tear down and rebuild as long as their plans fall within Unified Development Code regulations. With this regard the adoption of the updated Unified Development Code - approved unanimously by the Memphis City Council in August 2010 - has been an important step. Prior to the adoption of the UDC, the Landmarks Commission drew a distinction between preservation and conservation districts that in its language could be confusing in actual practice. This confusing terminology went away with the UDC, and today the coding relies on the language within each historic district's design guidelines to determine what is reviewable. 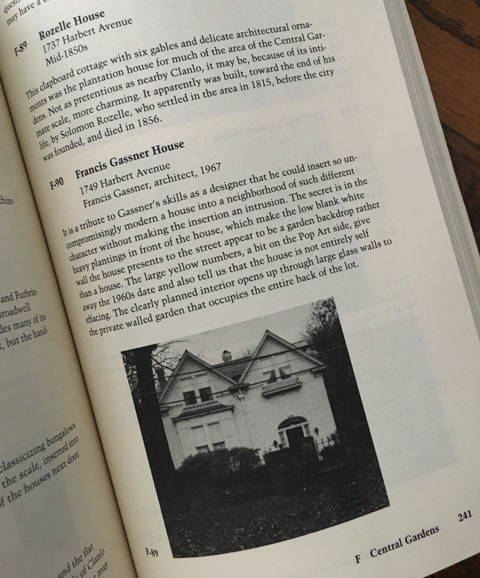 In 1992 our Central Gardens Neighborhood Association took the steps necessary to petition the city for a landmarks designation as a historic conservation district. Submitted with that petition was the detailed architectural guidelines that the neighborhood had established back in 1980 for their nomination to the National Register (and published in 1981 as the first Central Gardens Handbook). There were inevitable compromises. 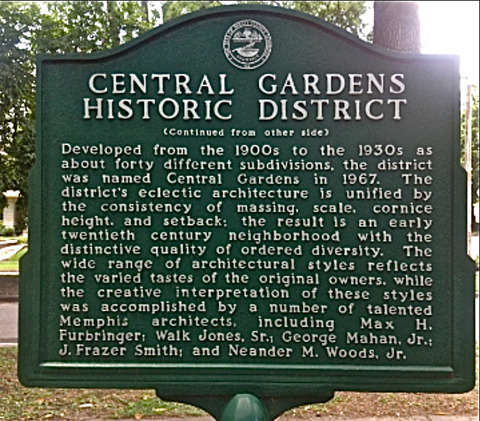 With anything of such magnitude, which required buy-in by the majority of residents and influential neighborhood institutions, such compromises are made with the greater good in mind; moreover, it is quite possible that the historic conservation district designation would have eluded Central Gardens if not for such give and take. It’s a lesson that other Memphis neighborhoods are being reminded of today. Without historic district and guideline protections, Lea’s Woods might be facing a massive development that could have had negative effects. Developments like these are generational - they take decades to correct. Its also a lesson that Midtown’s Cooper-Young neighborhood considers as they begin the same process that our Central Gardens Neighborhood Association initiated twenty-five years ago, a process that has been critical in helping the neighborhood retain its character, charm, and vitality.